Ken Pearson founded Pearson Ranch in 1959, which is a family owned ranch raising elk, buffalo (also known as bison), and cattle. Today, Ken’s grand-nephew Marvin Cromwell and his sons Brandon and Matt run the key operations for the company. 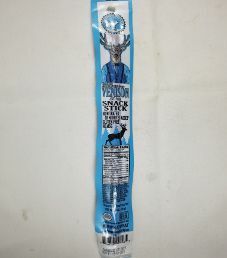 While Pearson Ranch Jerky has been in the meat snack business for over 15 years, the main focus of ranch operations shifted to meat snack products in the summer of 2011. In recent news, Pearson Ranch Jerky is now sold in 100 Academy Sports + Outdoors stores! 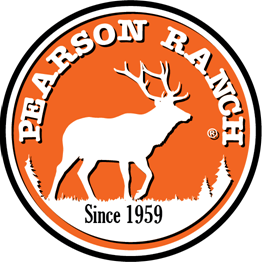 This Pearson Ranch Jerky brand name is distributed under the name of Pearson Ranch, and it is located in Horse Springs, New Mexico. The next review for Pearson Ranch Jerky will be on a 4 ounce/113 gram bag of their hickory flavored venison and pork meat stick. This meat stick has been reformulated with a tweaked ingredient list, and a brand new bag design. This bag was kindly submitted for review by the General Manager, Brandon Cromwell. Ingredients: Venison (Grass Fed), Pork, Water, Sea Salt, Citric Acid Encapsulated, Cane Sugar, Celery Powder Cultured (Celery Powder, Sea Salt), Black Pepper, Cherry Powder (Cherry Powder, Organic Cane Sugar [Evaporated Cane Juice]), Cayenne Pepper, Natural Liquid Smoke, Ground Coriander, Onion Powder, Granulated Garlic, in Beef Colored Collagen Casings. The venison, otherwise known as deer used is grass-fed. The pork used is guaranteed to be ethically raised, meaning no growth hormones or additional antibiotics are administered. As a result, the ingredient rating starts at a Very Good (9/10) rating. 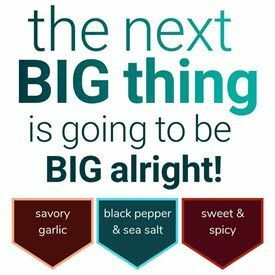 There are multiple healthy ingredients added such as black pepper, cherry powder, onion powder, cayenne pepper, and coriander. The sugar level is great at 0 grams of sugar rounded down per 28 grams of jerky. The salt level is acceptable at 290mg of salt per 28 grams of jerky. These meat sticks qualify to have no sodium nitrite added, or any other similar unhealthy preservatives. Instead, minimally processed sea salt is the main preservative. Commendably, these meat sticks qualifies to have no MSG added. The texture of this meat stick does qualify to be soft and tender, being easy to chew. 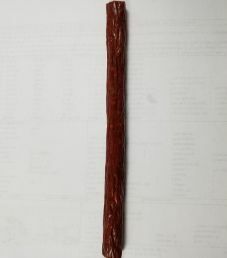 Admirably, there is no greasiness present when chewing this meat stick, which comes across as a high end, elegant product. Several flavors jump out at first but no single flavor dominates here. The saltiness is at a mild level, and the garlic/black pepper are at light levels. There is very little sweetness present. A great level of acidity really puts this meat stick over the top, and rounds off the flavor profile. The individual taste of venison is not distinguishable. However, the combination of venison with pork tastes great, and likely is a better tasting combination compared to venison and beef. A subtle smoked flavor in the background that blends in nicely. We were all unanimous here, Pearson Ranch outdid themselves with this venison pork stick. 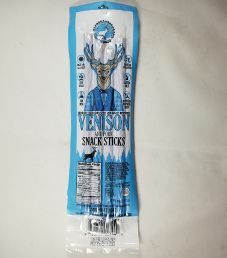 We all highly recommend this venison pork stick treat to even the slightest fan of meat sticks, and also sold at a great price considering that grass-fed venison is used here. 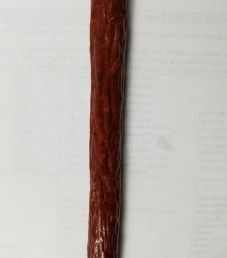 This 4 ounce/113 gram meat stick sells online for $7.99, which equates to $2 per ounce. That rates as a cheap price. This plastic bag has everything imprinted on the front, and nothing on the back. Recently, the Pearson Ranch bag designs were changed, advertised as “Character Jerky Bags”. There is a cool looking picture of a deer wearing a a vest, suspenders, and bow tie. There are no slogans printed on this bag. Some facts printed on this bag are “Made With Sea Salt”, “No Nitrates or Nitrates Added”, “Soy Free”, “Gluten Free”, “8g Protein Per Serving”, “Made From Feral Swine And Pork”, “Made in USA”, and “No MSG”. All bag categories are covered with this bag. The hashtag #urwhatueat is displayed. The bag listed at the bottom is a 1oz venison pork meat stick also graciously submitted for review.